What makes for the ultimate girls’ day? Do you pamper yourself with a manicure? Experiment with the latest make-up products? Try out some new hairstyling tips? If you ask Cosmopolitan Magazine, the answer is: all of the above! 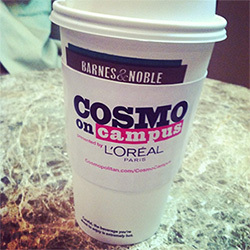 Recently, Cosmo partnered with Barnes & Noble College Marketing to bring all of this and more to ten lucky college campuses as part of its Cosmo on Campus Tour. Not only were these events a huge hit, attracting more than 17,000 people, they also helped to reinforce the bookstore as a true social hub on campus. When Cosmopolitan Magazine, the leading magazine among college-aged women, wanted to reach more female students, they turned to Barnes & Noble College Marketing to create exclusive events on ten of its campuses. Each event featured Cosmo taking over the campus bookstore for a day of beauty, setting up three different stations offering free manicures, mini-makeovers and hair consultations. A student receives a mini-manicure at the University of Central Florida Bookstore in Orlando, Florida. To promote the Cosmo tour, store managers went above and beyond to reach the students on their campuses, handing out invitations to sororities, publicizing the tour via social media and email, and connecting with new students through freshmen orientation and housing events. 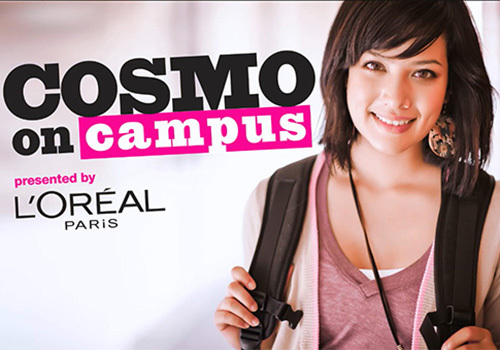 Additionally, ads for the tour were placed in Cosmo Magazine, providing not only the universities, but the bookstores, with a national presence. From campus to campus, each one of the ten Cosmo events was a stunning success, with large crowds and near continuous lines throughout the day. Students who visited the manicure station were able to choose from a wide variety of L’Oreal nail polish shades, including “I Pink I’m in Love.” Beauty experts at the hair consultation stations offered advice on what hair colors, styles and products best suited each visitor, while the third station pampered students with a mini-makeover, complete with beauty tips and product information. Attendees also received a “swag bag” filled with free goodies – including L’Oreal Paris hair color and perfume from Justin Bieber’s new fragrance line – as well as the opportunity to win a stylish Ann Taylor wardrobe sweepstakes prize and a $1,000 scholarship. 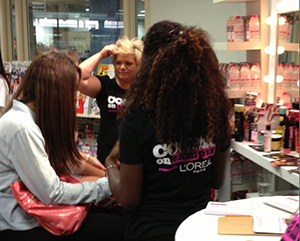 Cosmo and L’Oreal representatives consult with a student at the GMU Bookstore at George Mason University in Fairfax, Virginia. Overall, the success of the Cosmo on Campus events was off the charts. The Barnes & Noble at IUPUI Bookstore at Indiana University – Purdue University Indianapolis, for example, saw a six percent increase in sales that day, while other schools, like the University of Southern Mississippi, experienced a significant increase in bookstore traffic. Yet the real success of these events was in their ability to continue to portray the campus bookstore as a true social hub on campus – not just a place to purchase textbooks and merchandise.